I'm sure many of you have seen this "messy bun faux hawk" hairstyle at dance competitions and recitals, figure skating events, gymnastics meets, cheerleading, and other special occasions. It is quite popular and trendy right now. You may have even worn it yourself! It's such a cute and edgy hairstyle, while looking formal and polished at the same time. This style is "high fashion" and really adds to the look of a costume and dance routine. But, as I mentioned in our video (below).... when I found out this was the hairstyle my daughter was assigned to wear for her dance team competitions this year, I was a little worried. As some of you with long hair probably know, messy buns can be a struggle! 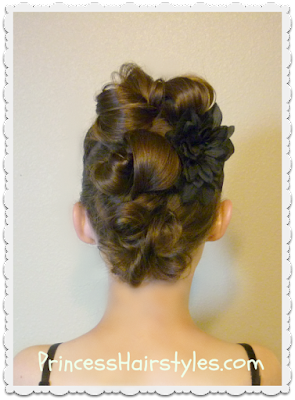 And with this hairstyle, you not only have to make 1 messy bun, you need to make at least 3! There are quite a few tutorials of this style online already, but I did not see any for super long hair. So, after some trial and error, we finally found a method for making our buns that works ALMOST every time and we wanted to share it with all of our "long haired" subscribers. 7 medium size, clear elastics. We used Goody brand ouchless elastics (affiliate.) You will need 9 if you decide to make 4 buns instead of 3. Lots of bobby pins. 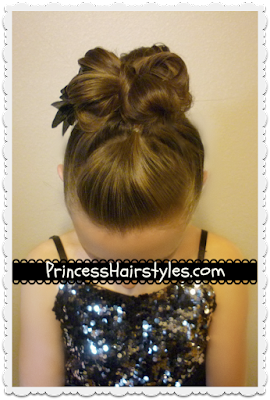 Be sure to secure the buns really well if you are using this hairstyle for dancing. The bobby pins we use are from Sally Beauty Supply (affiliate) and they hold extremely well. Hairspray, gel, pomade, or other product to keep the sides of your style smooth and free of flyaways. P.S. Luckily, messy buns are supposed to be, well... messy. So, don't worry too much about getting things absolutely perfect while making this hairstyle. Ends popping out, part lines not quite straight, and buns and aren't symmetrical are going to be ok. The messiness is part of the charm! P.S.S. 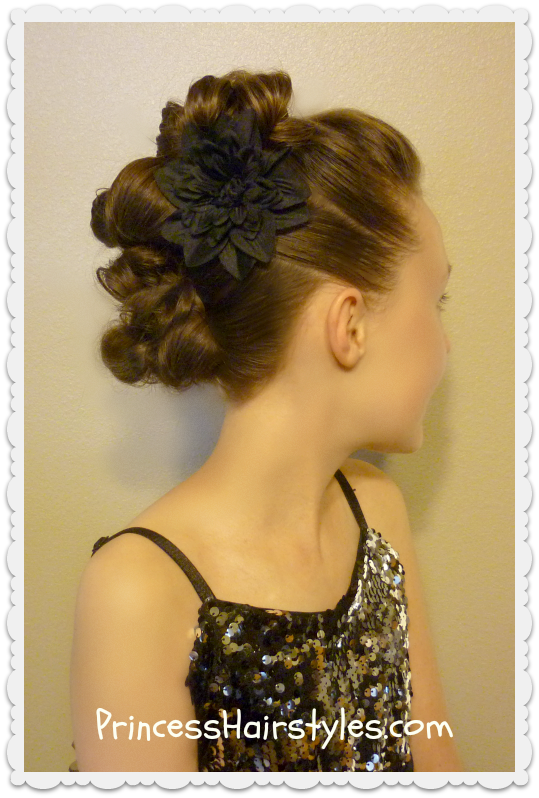 This hairstyle isn't only for dance. I think this faux hawk would be adorable with just the right prom dress or homecoming dress. It could also work with certain Halloween costumes or even as an updo for church, weddings, or other formal occasions. This method for making a messy bun can also be used for making a quick "top knot" hairstyle, which we recently showed in our "7 easy hairstyles for school" video. You can check that out here. Hi I have three questions. My first is What book was she reading? Second why can't we see her face and know her name? I kind of like Cute Girl Hairstyles cause you can see the girls and know their names. Thirdly Can you PLEASE make ones that work with shoulder length hair? Thanks! Gorgeous! I love the idea of having a faux hawk by doing this sort of updo - seems like a fun way to try something different without cutting the hair. Hello! I love your styles, but I have a quick question. How long is your daughter's hair, exactly? And how do you keep it so neat? My hair barely reaches my waist and it's full of split ends....without ever using any heat. I usually have to do my own hair (I'm 14), and it's a bit harder, especially considering that I can't see behind my head. Thanks for all the creative ideas!